Dolphin fishing in Key West is red hot this summer. Check out our Deep Sea Fishing Charters to get out there and get your Fish On! 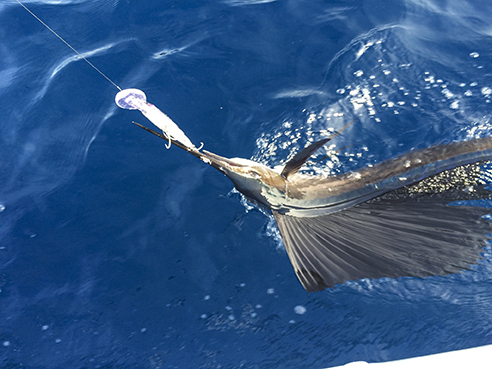 Sailfish Up For Release on Board the Gotta Go with Capt. Rob Harris. November 25 2015 – High winds all week and expected to continue. A late shift in Summer versus Winter patterns here in Key West but still offering some great opportunities offshore deep sea fishing. December looks like its gonna be HOT for deep sea fishing here in Key West. The winds have it. Control that is. 15 – 25 mph mostly out of the North East these last few days and expected to continue through the forecast period at least till Wednesday. Bad new? No, not really. High winds mean god fishing. 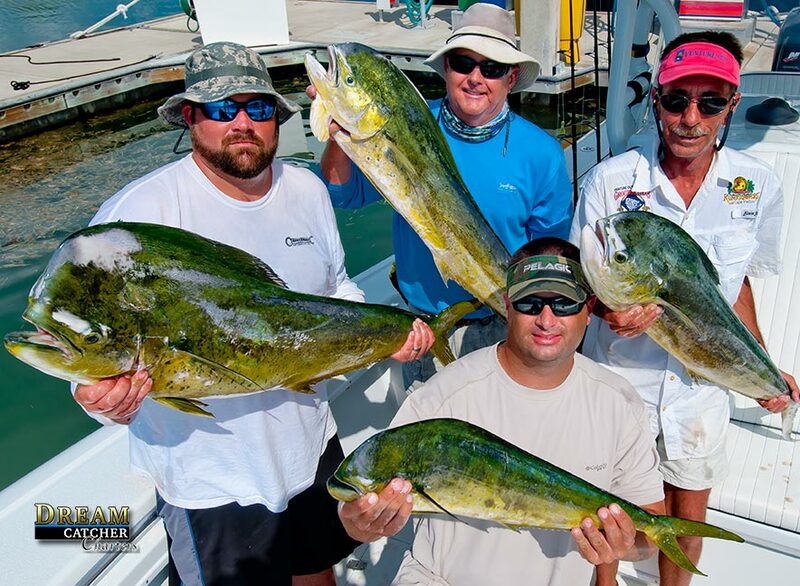 With heavier seas comes some great fishing here off of Key West IF the anglers, captains and mates want to brave it. Some sea conditions have been reported of up to 8 ft on the higher wind days. These sea conditions really stir things up in the deep sea waters changing things over from summer to winter. Up until last week we were in the high 80’s and moderate South East winds that ushered in the latest seasonal dolphin bite many of us have seen in years to cap off a great 2015 for dolphin (Mahi Mahi) fishing here off of Key West all together. Now we are in the low to mid 70’s and winds from the North East. This means great tuna, sailfish and wahoo fishing and it has already started. Some boats have reported days of 3 releases on sails on half day trips, lots of black fin tunas in the 20 – 30 lb ranges with a consistent wahoo bite with up to 40b fish from American Shoals light down to the Bar off of Boca Grande West of Key West. You will earn it however as I said earlier in this report seas are expected to stay up through Monday the 30th of November. Next week winds are set to lay down a bit for anglers to have a great shot at some fantastic winter species here off Key West Deep Sea Fishing. December is a great time to book a trip to the Keys for a weekend or a week as prices are as low as they get right before December 20 that marks the start of our Christmas Week. Traditionally speaking with a warm November comes a cooler December with cold fronts stacking up and the North Easterly winds ushering in a great sailfish bite. Get on It. December looks good for bookings for Key West deep sea fishing trips with lots of availability till December 20.. then it gets slammed so book ahead if you are looking for a good boat Christmas week. December is a great time to go deep sea fishing as the fish are right up tight to the reef smashing copious amounts of bally hoo schools and making a mess out of it. A prime time to be there trolling baits and catching a trophy.. Call us to Book a Deep Sea Fishing Trip in Key West. Island Genn will help you get with any of her professional crews on the water to show you a fun day of sport fishing. She has boats from 38 – 47 ft to chose from for your day.